If you’re in the market for a trendy teapot, you’ll want to check out this giveaway. Here’s your chance to win your very own BonJour’s Prosperity Teapot! We’re thrilled to be giving away three BonJour Prosperity Teapots to three our fans. Enjoying a freshly brewed cup of energizing Earl Grey, or soothing chamomile mint tea is simply and elegantly mastered with BonJour’s Prosperity Tea Pot. Originally introduced in Black, the infuser-style teapot is now available in three new trendy hues: Lavender, Green and Red. Crafted in durable glass for superior heat retention and clarity, the Prosperity Teapot brews up to five cups of tea from loose tea leaves for optimum flavor and aroma. 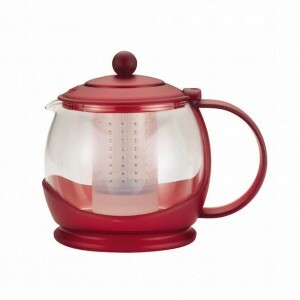 Inside the teapot is a removable, patented BPA-free polypropylene infuser basket. Similar in concept to a French Press coffee maker, the perforated infuser basket holds the tea leaves, allowing them to circulate with the hot water to brew. Once the desired strength is reached, the brewing action is stopped by pushing down on the teapot’s knob to plunge the tea leaves into the solid chamber at the bottom of the infuser basket. This stops the brewing, and prevents the leaves from dispersing into the teapot, producing deliciously fresh tea that is not over-brewed or bitter. BonJour’s Prosperity Teapot is protected with a sturdy and colorful built-in frame and coaster, which also protects countertop and table surfaces. The teapot’s integrated stay-cool handle provides a wide arch to protect hands when holding and pouring hot tea into cups and mugs. So if you’re ready to perk up your mid-afternoon slump with the many health benefits of tea drinking, then enter this giveaway today. Leave a comment below telling us what is your favorite way to have your tea. IF YOU SHARE ANY CONTENT FROM OUR SITE WITH YOUR SOCIAL NETWORKS, YOU’LL RECEIVE EXTRA CREDIT TOWARD THIS PRIZE. BE SURE TO TELL US THAT YOU SHARED CONTENT IN THE COMMENTS BELOW. I love Chi Tea Lattes both hot and cold! I enjoy tea all day long and all year, tea with lemon is my favorite indeulgence. I Like AFH on Facebook! I like to add a little honey to my tea and sometimes hot milk depending on the flavor of tea. I love green teas – adorable tea pot!! I have signed up for our no-spam-ever once weekly e-newsletter. My favorite way to have tea is with honey/lemon. I have shared this giveaway on Facebook – Thanks for the chance!